Good Morning Britain host Piers Morgan has clashed with Tory Minister Michael Gove over the Government’s handling of the Grenfell Tower disaster. A massive fire engulfed Grenfell Tower in the early hours of June 14th. Grenfell Tower is a 24-storey building of public housing flats in the North Kensington area of London. Over 600 people were believed to be inside the building and there are fears that the death toll, currently at 58, will rise to over a 100. This incident generated a wave of public anger over ignored safety warnings, an inadequate response from authorities, and most of all about the (housing) policies that safeguard corporate greed over the rights of the poor and working class, in this case their very lives. This was no accident – it was corporate manslaughter. In the immediate aftermath, and with the fire still blazing, incriminating elements started coming to light. First of all, the risks of fire had been brought up repeatedly by the tenants of Grenfell Tower and brushed aside by the landlord, the Kensington and Chelsea Tenant Management Organisation (KCTMO), and the local Tory council. In fact the Tory government has been time and again faced with the risks in these tower blocks, even dismissing an attempt last year by Jeremy Corbyn and the Labour Party to make houses safer as “unnecessary regulation”. Adding to this, Grenfell Tower had a £10m refurbishment last year. During this refurbishment, an outside cladding was added to the building. It has been reported that this cladding burned incredibly quickly, spreading the fire to the upper floors. What was the reason for this addition? Improving the view from nearby luxury flats. And if this was not enough, it has come to light that it would have cost a mere 5000£ more to make these cladding panels fire-resistant. It is worth spelling this out. A deadly fire was made much worse, dozens of lives were lost, because rich homeowners did not like the view of poor people and a landlord wanted to cut corners with cheap materials. This paints a clear picture of a government, both at national and local levels, whose policies and (loosened) regulations are meant to favour the wealthy and their real estate dealings. The gentrification and social cleansing of poor neighbourhoods in London to make room for expensive new property has been going on for decades now, driving people away and rent prices up. The current situation made even worse by a disastrously incompetent response from (local) authorities. While charities, volunteers and donations arrived swiftly on the scene, there was no coordination of their efforts from official bodies. Days after the fire there were families still sleeping on floors! Tory officials, London mayor Sadiq Khan, and especially Prime Minister Theresa May all caught the ire of Grenfell residents. May was criticised, and rightly so, for refusing to meet with the victims. For his part, Jeremy Corbyn was welcomed with open arms by the public, residents and grievers. His empathy is genuine and his track record of fighting for the rights of the “many” is unassailable. Corbyn’s growing popularity, despite a near-unanimous media siege, is due to the content of his policies, among which was the plan to build 500.000 houses in order to tackle the runaway rent and housing costs. It is in fact quite obvious, once we look past capitalism’s defence of private property above all else, that the solution for families without a home are vacant houses. I would even go further and suggest that this solution of seizing empty luxury houses apply beyond the residents of Grenfell Tower so that homelessness and inadequate living conditions are solved instantaneously. One could even make a kind of reverse lottery out of it. Instead of a normal lottery where a random person gets rich, this time a random rich person gets slightly less rich and a poor, working-class family gets to live in proper conditions with an open-ended lease of 1£ a month. 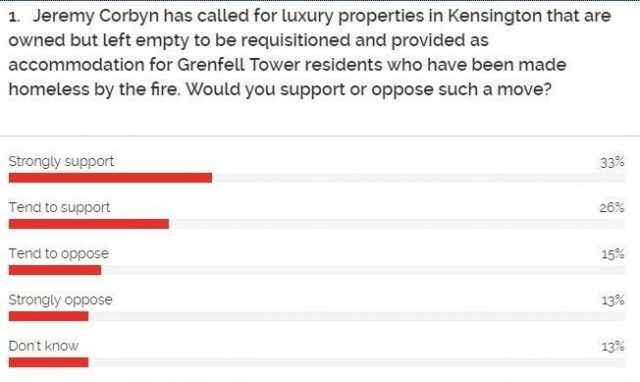 A YouGov poll found that 59% of respondents supported Corbyn’s idea of requisitioning luxury properties in Kensington to house Grenfell Tower residents. Community activist Ishmahil Blagrove address the gathered crowd gathered for the Justice for Grenfell Rally in London. After the disastrous electoral gamble that forced the Conservatives into an alliance with the fundamentalists [of] the DUP, this episode and the inadequate response might be an opportunity for the Conservatives to get rid of Theresa May. But at this stage [that] will not solve all their problems. Shehab Khan calls upon Tory Party Prime Minister Theresa May to resign over her government’s mishandling of the Grenfell Tower fire response. The government (led by May or anybody else), the Conservative Party and the large sections of the Labour Party that oppose Jeremy Corbyn, even if they have been forced to jump on his bandwagon, will be hoping that all this public anger is funnelled to the official channels. This will mean parliamentary inquiries, some officials stepping down, maybe even someone getting prosecuted for negligence. What they cannot afford is for this anger to keep boiling up in the streets, with a Labour leadership that is as radical as it has ever been. People are beginning to realise more coherently that there is a concerted effort to sacrifice them in order to safeguard the luxury and privilege of the wealthy. They are, in other words, building class conscience, and this mobilisation and demand for justice may very well spiral away from the traditional, parliamentary ways of doing politics in the UK. And that is no doubt a frightening thought for capitalist elites. (2) Corbyn has doubled-down on the idea and the establishment media are running really scared! British grimer Akala speaks out to Channel 4 on the causes of the Grenfell Tower Fire. This video from London, England is called London’s Muslims helping victims of Grenfell Tower fire. 19 June 2017: A leader [Paul Golding] of the fascist Britain First movement has threatened Muslims outside a mosque in London who were collecting food donations for victims and local residents affected by the Grenfell Tower Fire, Channel 4 TV reported.